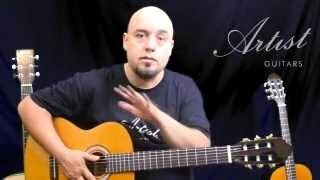 Not All Classical Guitars Are The Same! 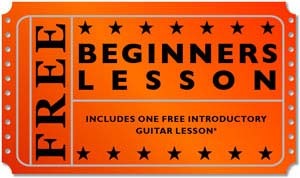 This is an ideal guitar for beginners. Its nylon strings are easy on beginner hands and its 4/4 size (full size) suits adults and larger players (if you're looking for a smaller version look at our 3/4 and 1/2 range). With a great sound to inspire you and a design and set up specific to beginners, you'll breeze through the first stages of your playing. It has a Low String Action (all our guitars are set-up at the factory for optimum beginner playing level). String action is the measurement from the top of the 12th fret to the bottom of the string. This is very important because a guitar with a high action is hard to play, a guitar with too low an action will buzz and sound bad. Artist Guitars are set up at the factory for the optimum level for a beginner. A Truss Rod that allows you to correct for the effects of weather on the guitar help keep the neck straight and the action height the neck can be adjusted. You will struggle to find a guitar at this price with a truss rod. 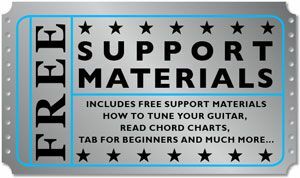 Comes included with a Bag to protect your guitar, Strap and Built-In Tuner - A tuner for a beginner is vital. A guitar needs to be tuned every time you play. This tuner is extremely simple to use so you will be using it correctly in no time at all. 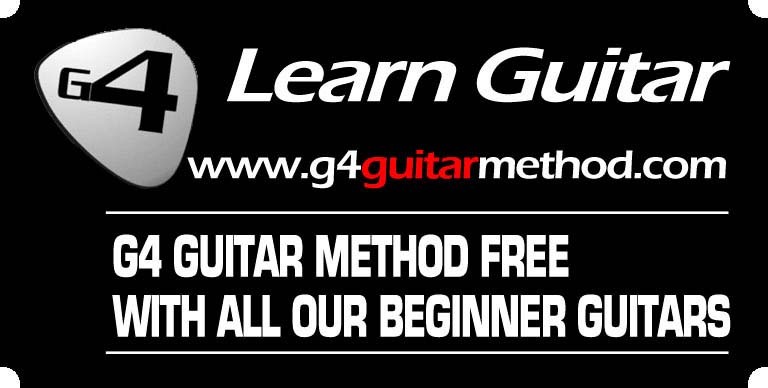 Why wait to start learning Guitar when you could get one of our great CL44 guitars and be playing in no time at all. We ship super fast!! Our range of CL guitars have been designed for the needs of beginners - we don't offer a confusing range of models in this area as we think getting the correct size guitar is the most important thing for a beginner, once you have been playing for a while you will find it much easier to know which style of music you want to play and we can recommend a great 2nd guitar for you. The CL44 is an ideal beginners guitar suited to adults or children (from 13 years old or 165cm and up) - If you're on the smaller (or younger) side we suggest you check out the CL34 range or smaller. If the information is confusing and you would like some free advice just call us on our Toll Free Number so we can help you to choose the perfect size for you. Neck :- 25.5 Inch Scale Length, 52mm Nut, Truss rod to keep your neck straight - No other guitar at this price has a Truss rod. Save a bundle using Artist's high quality Nylon, Classical Strings designed for tone and playability. You'll find a warm tone similar to other popular brands on the market, but at a fraction of the cost! This set includes 3 Clear Nylon and 3 Nickel Wound (nylon core) strings. Try a set today, we're sure you'll be pleasantly surprised!